Would you like Karate? A Karate master was asked what is the best martial art. He said it was another martial art. His student asked, "then why do you teach Karate?" He said, "I'm in it for the victim." Do you like fast forms, linear punches and kicks, sparring? Karate, Taekwondo and Kung Fu are similar in this way. Our classes only include Aikido and Tai Chi with Kung Fu. Karate originated from Shaolin Kung Fu in China via the Okinawan Islands and modernized in the 20 century by Funakoshi Sensei. A typical Karate class in Westchester may include stretching, basics, katas or forms, some application and sparring. One studies the Karate katas to learn “the secrets” themselves, and develop skills for self defense. Karate emphasizes powerful strikes to disable an attacker initially, and later teaches how to control the attacker without harm. 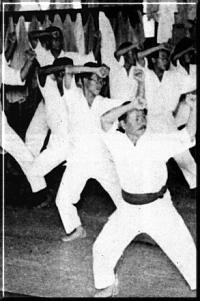 Generally, the emphasis in Karate is external (hard) power, as opposed to the internal (soft) power from Tai Chi. Karate uses a broad variety of weapons to complement empty handed practice. 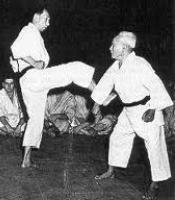 Modern styles of Karate may include Shotokan, Goju, etc. Exercise is often aerobic. In Westchester NY, Karate is available in Yonkers, Rye and Elmsford. Additional availability may be found in White Plains and New Rochelle for the lower Westchester region.